Quality holiday accommodation in the historic center of Meknes. Riad Felloussia has 5 comfy rooms and suites with a pleasing garden in the central patio and a wonderful view onto the primary square of the medina. Staff were extremely gracious and helpful. Knew about local services and even made me a drink to ease my sore throat. They were extremely polite. Beautiful riad in the medina. Fantastic breakfast included. Extremely friendly and helpful staff, although English is limited (as expected). I loved that it was not too far into the medina and there were signs leading to it, unlike most other hostels in Meknes. Also, the employees were super friendly and came to pick me up from Bab Mansour, as promised. Helpful staff, really clean. Excellent location, wonderful breakfast and a stunning friendly cat named Pistache. Beautifull riad with nice decoration. The inside garden is very nice with the 2 turtles. Confortable beds and clean. Staff friendly. Nice rooftop with a view on the spot El-Hedime. They come to take you at Bab Mansour so you don&'t get lost. Friendly staff, finest breakfast in Morocco, beautiful character-ful riad. This property is beautiful! It is a amazing deal for what you get and gorgeous. The place is also situated in a central location near the square. Also right after having traveled to numerous different cities in Morocco it was so refreshing to stay in a clean, gorgeous Riad with warm water and a nice bathroom. I recommend this Riad to all travellers going to Meknes. Also, the staff was extremely kind and helpful. 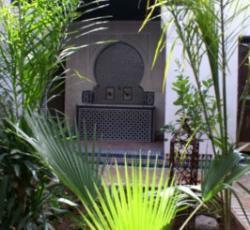 The riad is an old moroccan house renewed by an european man and it is wonderfull. each and every room is perfectly designed, clean, warm. the employees (only women) is extremely kind and polite. breakfast is awesome, in addition you can also have dinner (and i suggest you, ask for pastilla). the riad is situated in a small road inside the old medina, at first look it could seems not effortless to discover but there are a lot of signs. it is the greatest riad we&'ve ever seen. * Riad Felloussia Meknes rated 4.89 out of 5 based on 9 customer reviews. Hostel reviews with a star rating are sourced from HostelBookers. If you find Riad Felloussia Meknes with the same booking conditions at a lower rate somewhere else on the internet after you have booked, we will refund you the total difference.